From HKM of Germany, the Gently saddlecloth is one of our most popular HKM products. The saddlecloth is fully Polar Fleece lined and slightly padded to protect the horses back. The massage effect of Ice-Vibe encourages movement of the lymphatic system, draining inflammation and stimulating repair to damaged tissue. 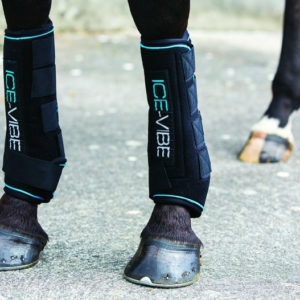 Using Ice-Vibe before exercise can help reduce the risk of injury by increasing blood flow to the tendons and ligaments making them more prepared and acting as a pre-warm-up warm-up. Everyday wear and tear on joints can be managed with daily use of the boots.